SENDING A GIFT BASKET FROM DULCET IS A WONDERFULLY WARM GESTURE - AND THE BEST CHOICE YOU CAN MAKE! Suitable and appreciated by all ages, everyone on your list is sure to be thrilled to receive a gift package like this one. BLACK AND WHITE COOKIES: The sweetest of dilemmas , chocolate or vanilla first? No worries if you can't choose - these cookies are soft, chewy, creamy and just the right size to eat in one bite LEMON BUNDT CAKE: A delcious lemony and moist bundt cake with a delicious zing from freshly squeezed lemons. Topped with white chocolate. BLUEBERRY MUFFIN: The blueberry muffins are large & tasty, with a sugary-cinnamon crumb topping. CORN MUFFIN: These muffins are moist and tender, with a slight sweet taste that's enhances the shredded kernel corns. ASSORTED RUGELACH: Our rugelach are every gift-receivers dream! A devilishly rich filling of chocolate, cinnamon & apricot erupt with gusto from within a lusciously doughy blanket - a divine indulgence CUSTOMER SATISFACTION - OUR TOP PRIORITY! Each package that leaves our store is self-designed and hand-packed. We have secured a relationship and deep trust with our customers like no others! Go ahead, click the "add to cart" button now, and join our thousands of satisfied customers! 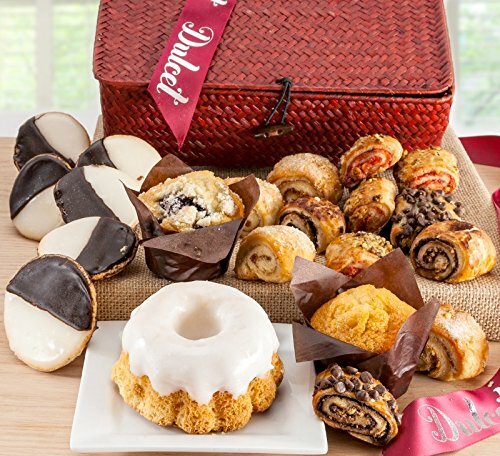 GOURMET GIFT PACKAGE: This re-usable red wicker basket arrives brimming with a collection of tasty treat: 6 black and white cookies, 1 lemon mini bundt, 1 blueberry muffin, 1 corn muffin, and 1 lb. of assorted rugelach. AN INSTANT PARTY: This top gift box is sure to be the hit of any business gathering or festive occasion. After all, who wouldn't enjoy a box filled with sumptuous selection of delectable treats? This package is guaranteed to make any ordinary occasion "out-of-the-ordinary"! LIP-SMACKING TREATS: Thrill your loved ones with this delightful assortment! Tucked inside the box is a fabulous array or mouthwatering delights. Perfect selection for all to enjoy. Your loved ones will be surprised and thrilled like never before! What a unique and top gift idea! SATISFACTION GUARANTEED: Providing excellent customer service is of utmost importance to us. If for any reason you aren't completely satisfied, just contact one of our customer service reps and we promise to make it right! Buy with us worry free!